We are allotted two checked bags per person for our flight to Macau. 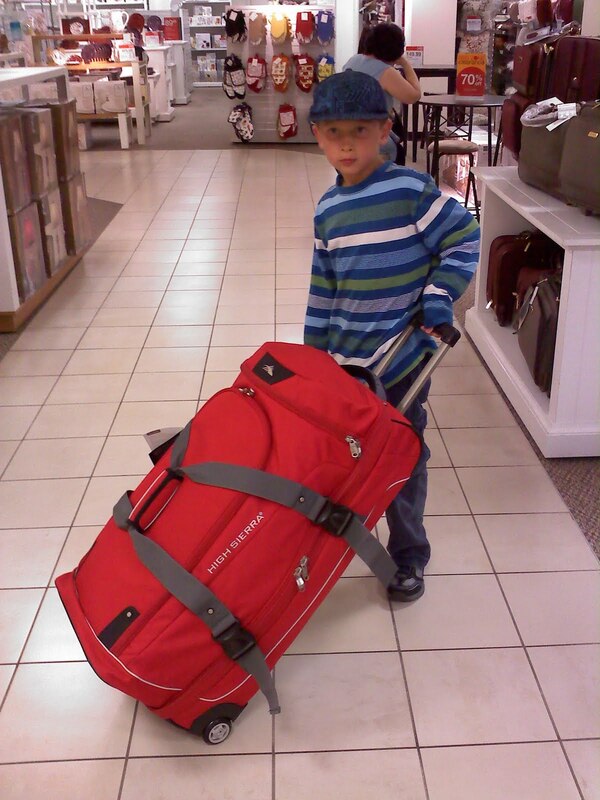 Which means for our family, we can check eight pieces of luggage, plus four carry-ons, plus four personal items. Because our shipment of household goods won't arrive for at least a month after we do, we really need to use our full allotment to bring over whatever we can! We used to have many more suitcases, but in the past decade pieces have been broken or lent out and never returned. So when Michael returns for us, he'll bring the two empty suitcases he currently has in Macau, and it's up to me to go find six more. You know what I found out today? 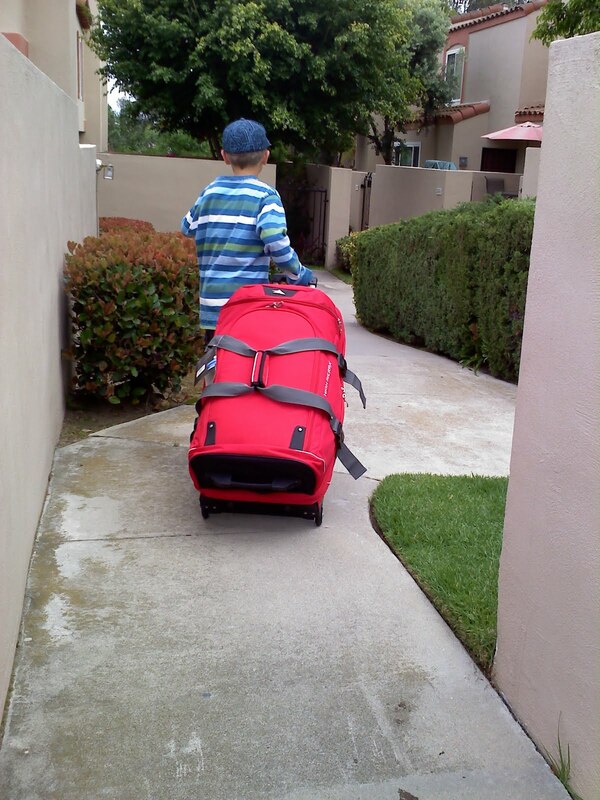 My son Benjamin is an excellent suitcase shopper. First he asked me what I was looking for, and then he walked around the store, checking prices and sales. When we narrowed it down to just a couple choices, he unzipped every zipper to make sure they worked, checked wheels, checked the interior lining, and walked them up and down the aisles to check maneuverability. And then once we selected one, he refused to let me take it to the car or into our house! He insisted on doing it himself, to help me out. He's such a little man, that Ben! 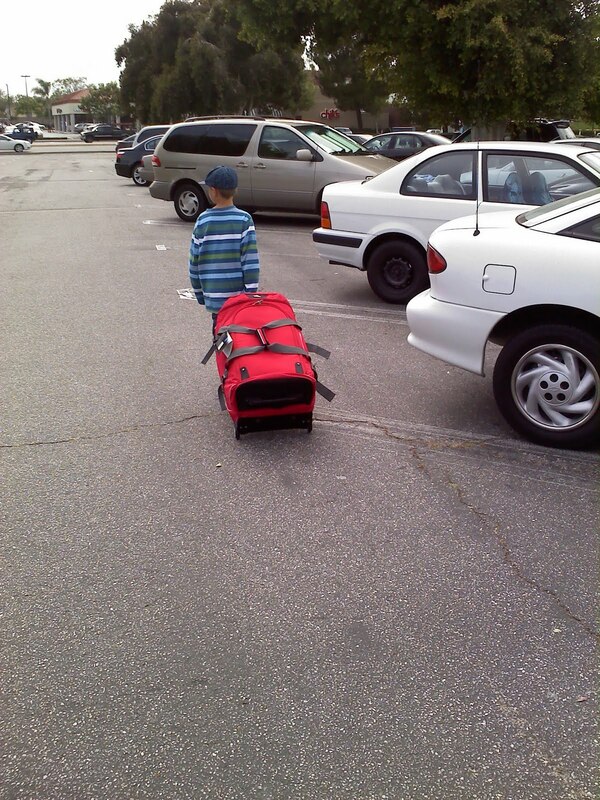 We have a rolling duffel that has zip-out backpack style straps which comes in very handy when you're traveling in places where you can't easily wheel a suitcase. In the next few years we'll be travelling to a couple places where that will be necessary. I've been searching for a second one under $100 with no success. Plenty of duffel bags, but no backpack straps. Today with Ben's help, I found the perfect one. So now I just need to find five more suitable suitcases! Duffel bags are great for road trips, because you can stuff them to overflowing. But they aren't great for air travel. Airlines have lowered their weight limits and added ridiculously huge fees for overweight bags. From lots of experience, I can tell you that duffel bags are very easy to end up going overweight. Our favorite non-duffel bags are the hard shell cases that have four wheels and spin. We got several hard shell spinners ten years ago in Japan, before they were available here in the U.S. I remember returning from Japan and our luggage got just as much attention as we did, from family who hadn't seen us in a year! Those cases travelled with us all over the world, and have been lent out many times. Sadly, at this point we're down to just one spinner. I've still got time to find more, though. I've got my secret suitcase shopping weapon: Ben! We'll be good to go in no time! On a different note, I think the upcoming move is suddenly weighing very heavily on Nathan. This is the first year he's really had a true Best Friend to share secrets with and have sleepovers every month with and talk on the phone for hours with. They'd made plans to be Best Friends all the way through high school, and were quite relieved to find out they'd be going to the same middle school in another year. This friend is Burmese and, like Nathan, is one that has also lived internationally and moved quite a few times. They have an easy shorthand when discussing living in this place or that, and slip into different cultures and traditions with ease. The friend's family are exactly the type of family you want your child to spend all his time with, and have the most gracious hospitality I've ever come across, inviting our whole family and anyone who happens to be with us when picking Nathan up to stay for a meal every time. Seriously, they are a dream. I'm incredibly sad to rip these two fast friends apart. Growing up, I went to a different school each year until I got to high school where I did all four years at the same school. I know first hand how hard this is on Nathan, because I lived it. It was hard enough last year when we moved to our current house and he had to switch schools. I was so certain we'd stay here so that the boys could go to the high school we wanted them to go to. And now for the second year we're pulling him away from friends. I feel truly terrible, and like I said, I think he does too. He's carrying heavy baggage of a different type than Ben and I bought at the store today. Today Grandpa Chase picked the boys up from school and brought them home for me. When Nathan saw me, he just gave me a big hug and said he didn't feel well. He said his head, throat, lungs, and stomach hurt. He didn't have a fever and his throat wasn't red, so I gave him a Benadryl and told him to lay down. He promptly fell asleep. That was at four, and it's now one a.m. and he's still asleep. I snuck in to take his temperature again just now, and tried to wake him up to see if he was okay. He sleepily said, "I'm fine. Life is hard, sleep makes it better." Wise words from a likely sleep-talking ten year old. But true. So I'm going to go to bed myself, and sleep off a little bit of this hard life, see if I can't lighten my load a bit.